As my friends know, I consider the Open Floor Plan to be a plague spot on American architecture, and it’s a plague that continues to spread. 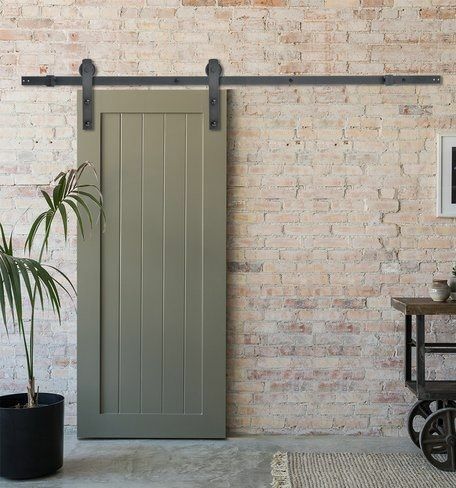 The home I recently purchased in Suffolk has lots and lots of walls and a few doors, and I’m a big fan of walls and doors. Nonetheless, one of my favorite rooms in the house - the den at the southeastern end of the house - had two cased openings but no doors. The den has become my “nest” where I can curl up on the couch and watch TV or just look out the large sliding glass door into the peaceful back yard. In the morning, sunlight streams in through the three capacious windows. It’s the only room in the house that has windows on three of its four sides. 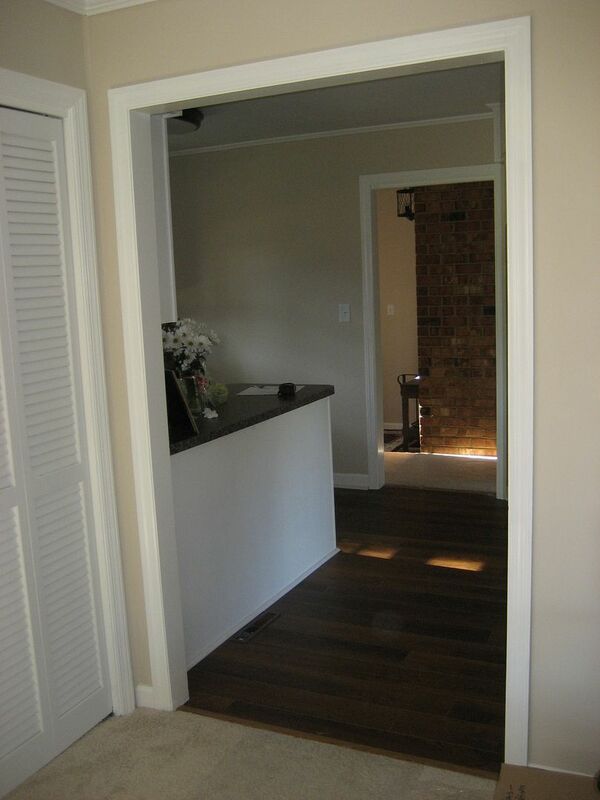 I wanted doors, but didn’t want to obstruct any of that wonderful light in the contiguous rooms (kitchen and dining room). So I came up with a plan. Check out the pictures to see my unique idea. To read one of my favorite blogs, click here. As Teddy demonstrates, there is no door between the kitchen and the den. Not good. 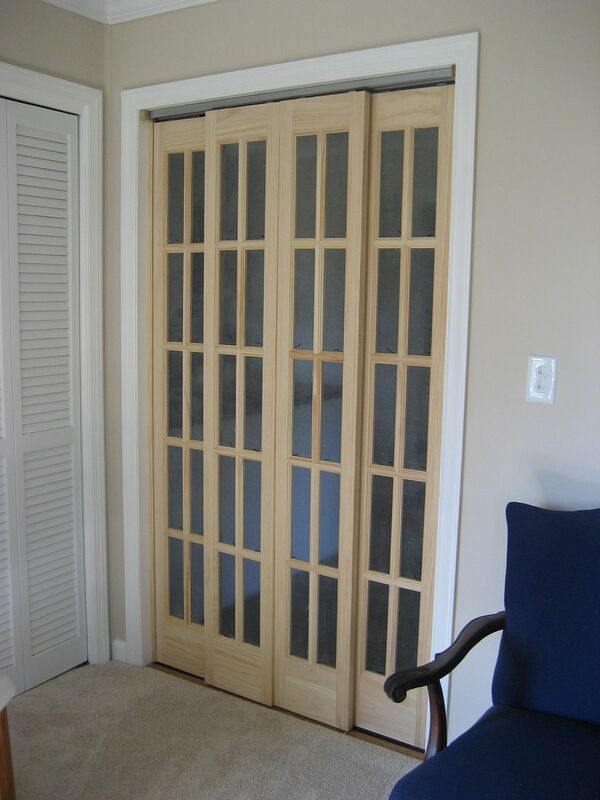 I need doors and lots of them. My "nest" can be seen in the background. 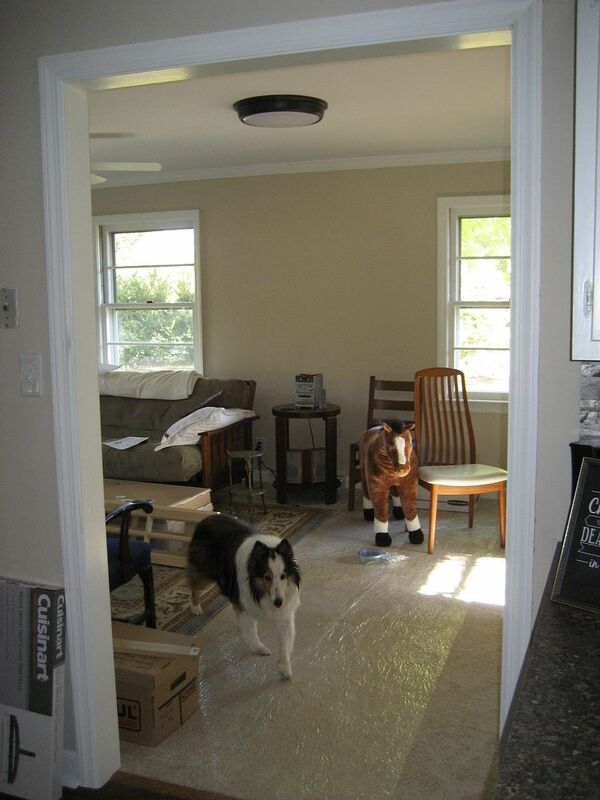 And yes, that's an enormous stuffed horse. And when I curl up on my nest (on the couch in the den), I can see the kitchen. Not good. The kitchen should not be seen or heard. I don't want to think about the kitchen. Ever. So I had an idea...and it started with these doors. 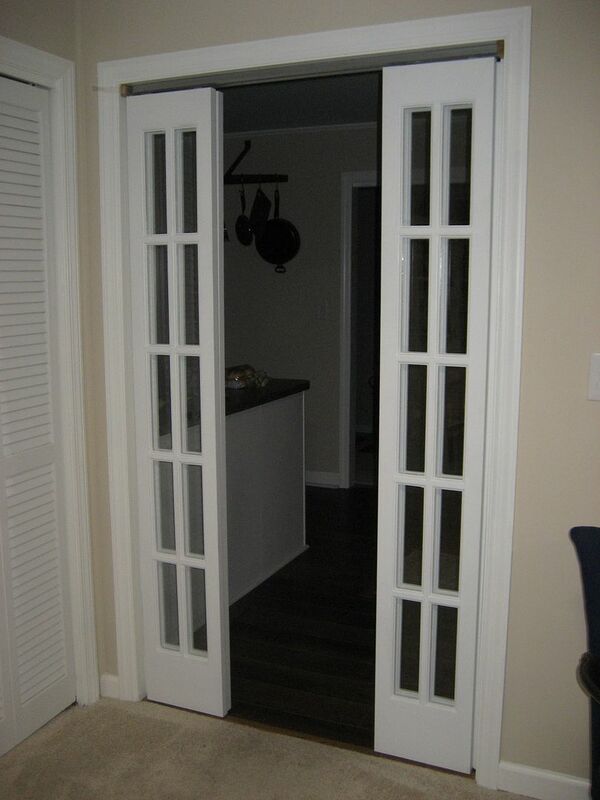 These are bifold doors, ordered from Lowes Hardware. 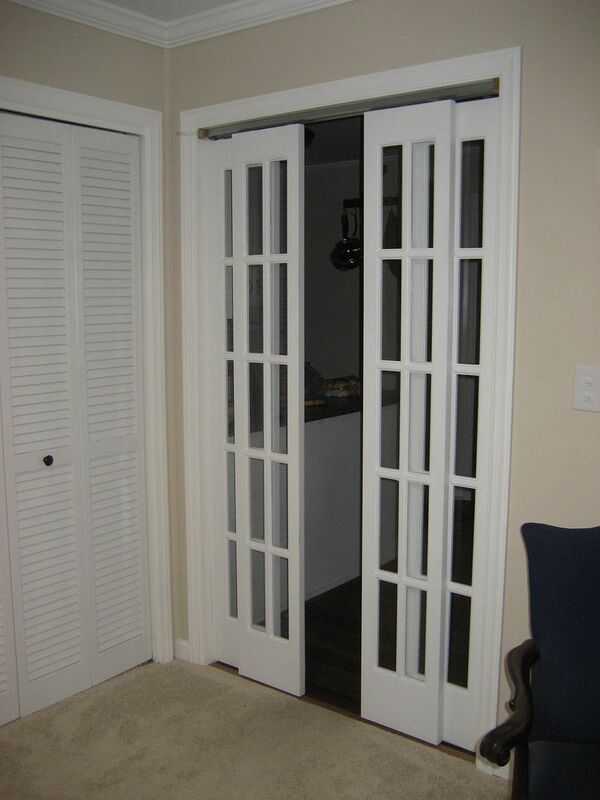 I purchased two sets of these doors (on sale) 24" wide, so that the two sets would match my 48" cased opening. They arrived expeditiously and in fine shape. I removed the hinges and patched the small holes left behind. The hinges were surface mount (not mortised), so it was easy to patch the screw holes. 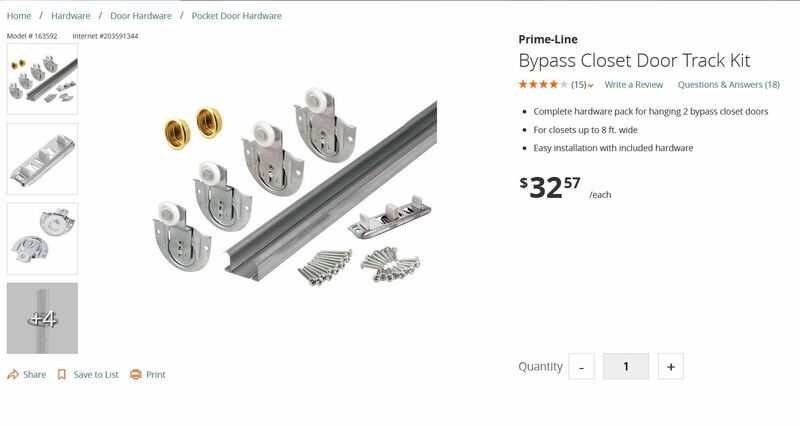 I also purchased this "bypass closet door track kit." 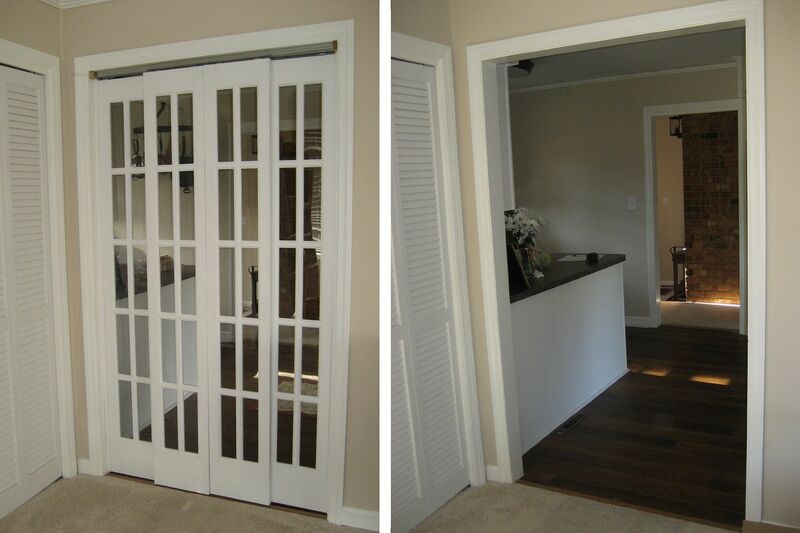 It's designed for closet doors, and the "bypass" allows for two doors to be on the same track. 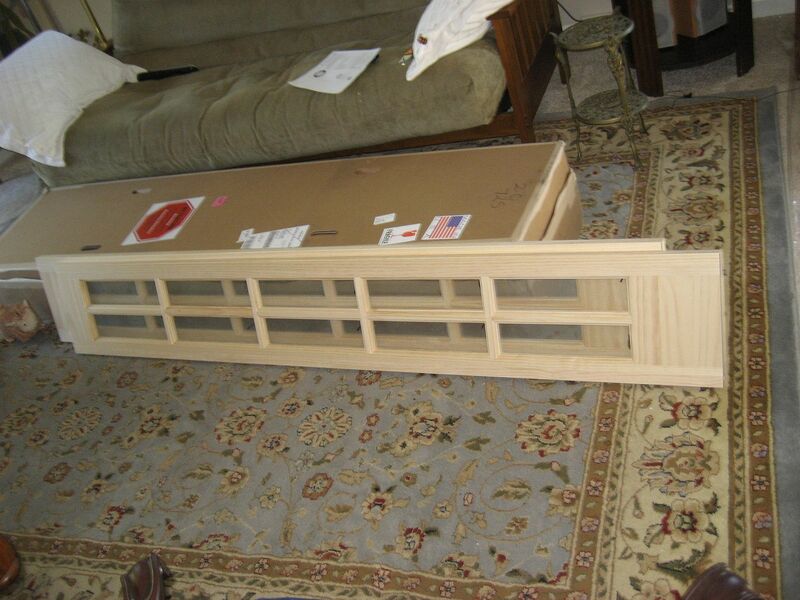 According to the weight specs, it was more than sturdy enough to support my discombobulated French Doors. 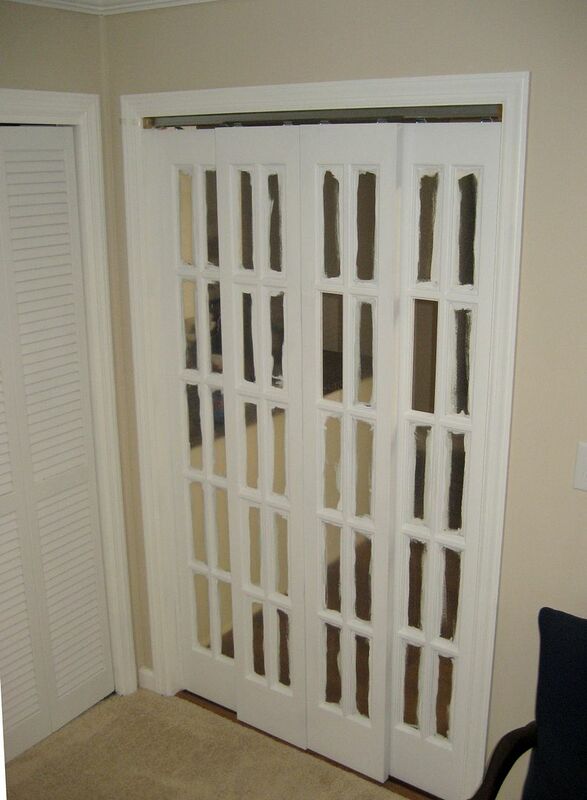 Next, I installed the track in the doorway. It was one inch too long and had to be cut down. Installation was very simple and fast. I didn't use the screws that came with the kit, but opted for something more substantial. 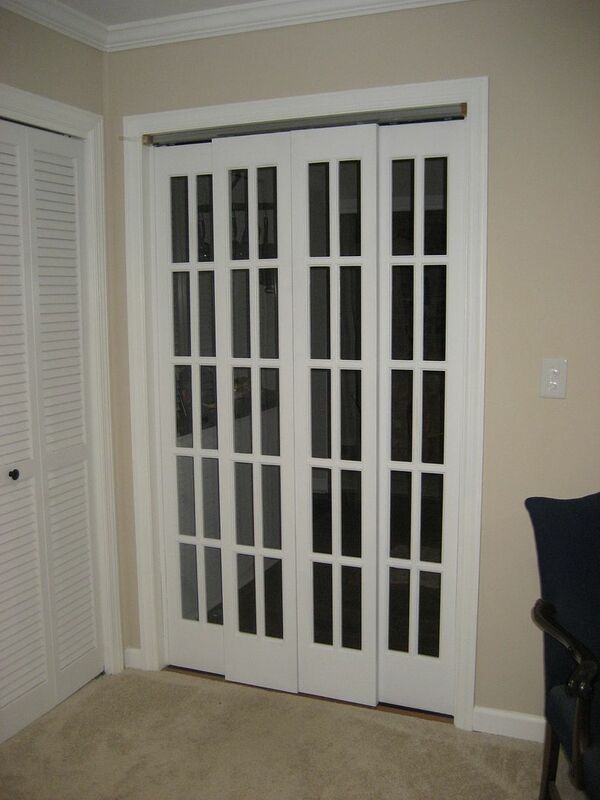 Next, I affixed the corresponding rollers to the top of these wooden doors. 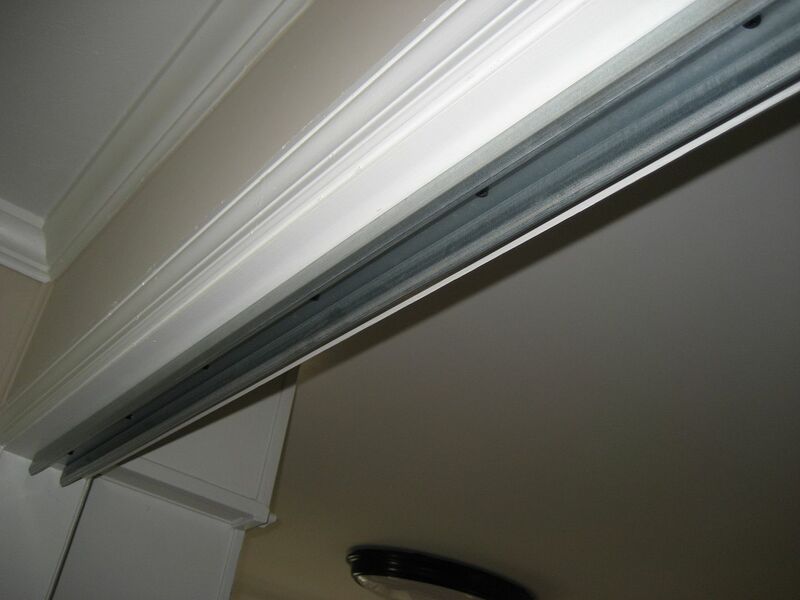 With the track in place, installing the doors was quite simple. And they worked so well! After a brief moment of admiration, I pulled them down for painting. 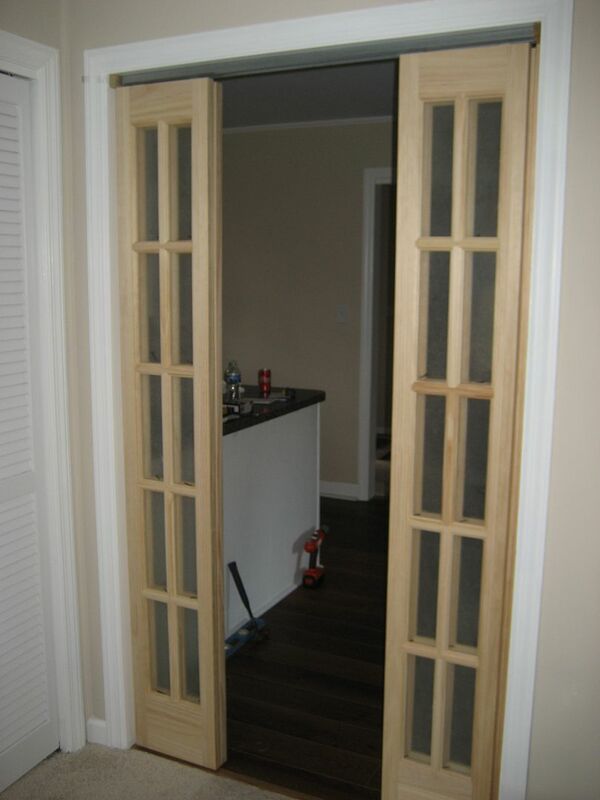 The doors were of excellent quality, and the glass was covered with plastic to protect the glass during painting. 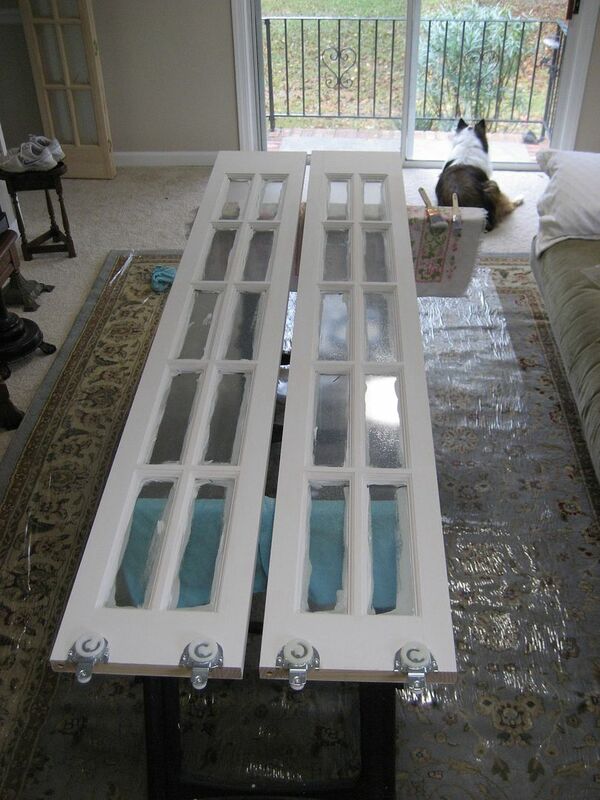 I applied one coat of primer and two coats of paint. This was the most time-consuming process of all. 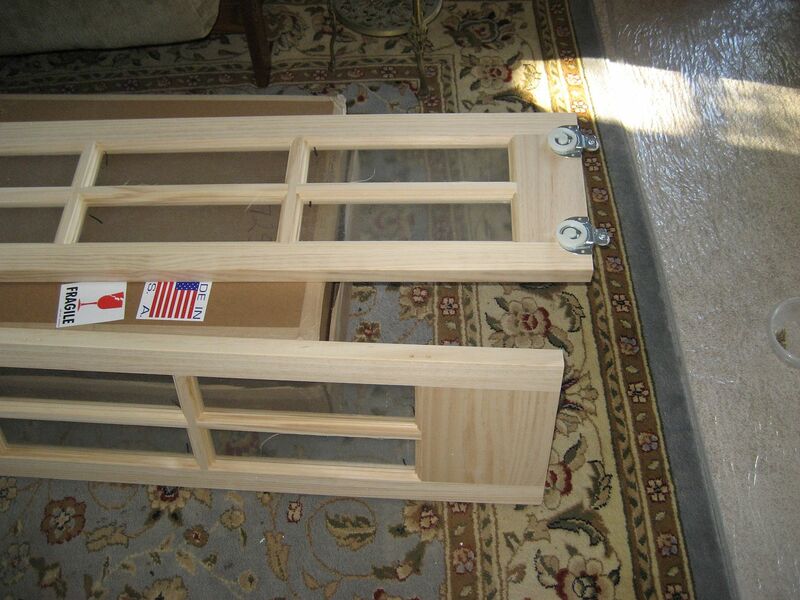 These doors sat in my den (on sawhorses, atop plastic) for quite some time. After the painting was done, they were reinstalled (which took a few seconds). Even with the paint slopped over the edges, they looked quite attractive. And once completed, it looked fantastic. Or shut all the way. 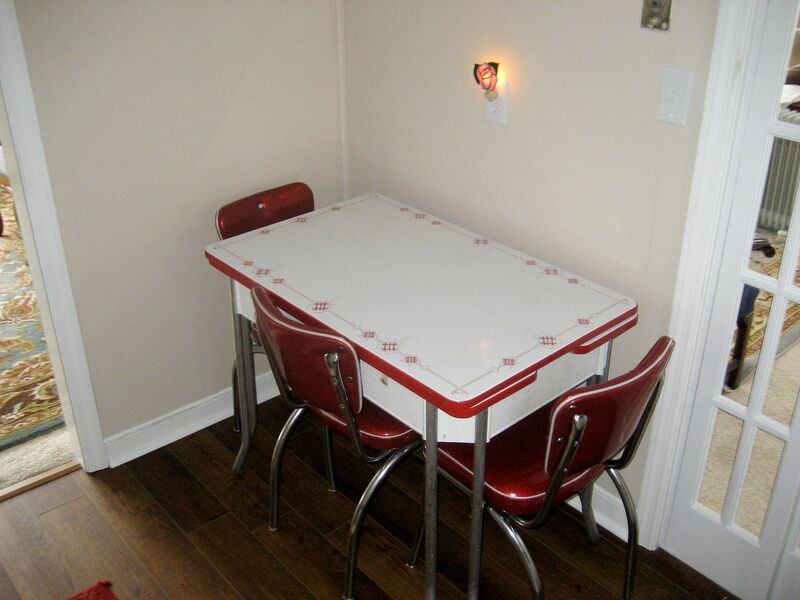 Even the dinette set (in the kitchen) is happier. "Before and After" photos. Actually, they're in the wrong order. The "after photo" is on the left. Oops. Best of all, I can sit on my couch and not see the kitchen! Mission accomplished. 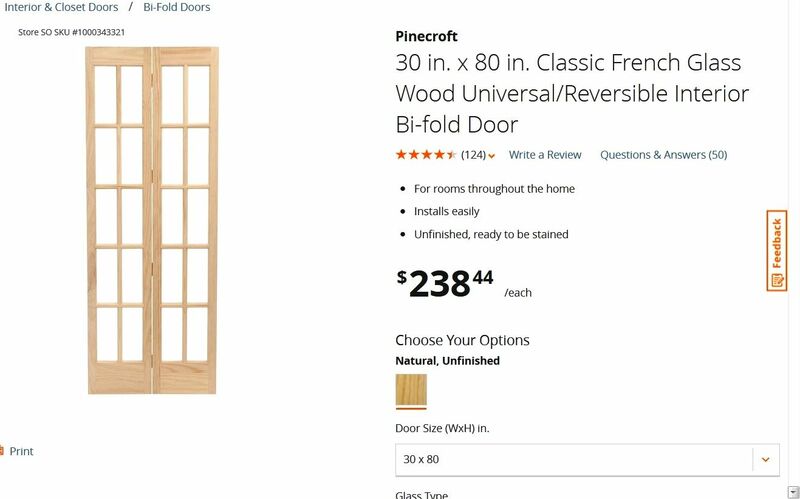 Originally, I'd thought about installing something like this, but it was too big and bulky and didn't fit the style of the house. Plus, I didn't have the wall space. And it would cut off the light from the other rooms. Not good. 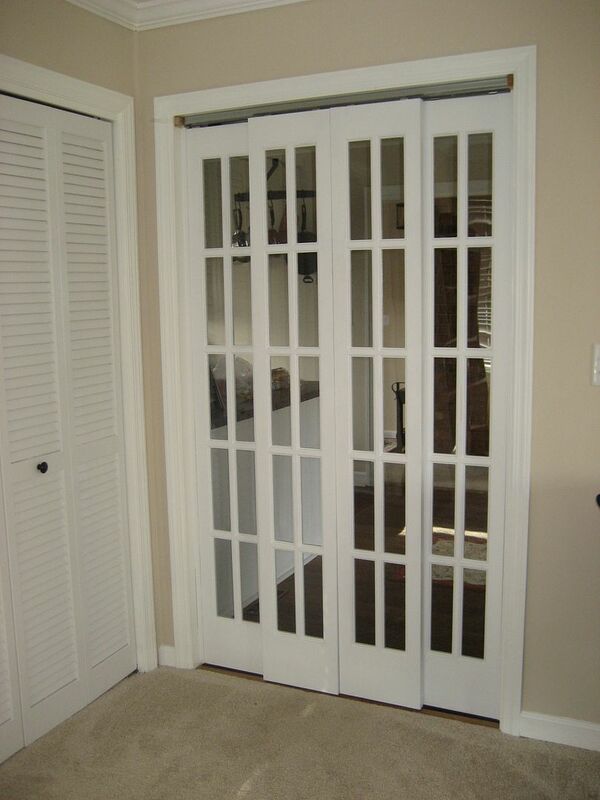 With these French Doors, the sunlight still fills the house! 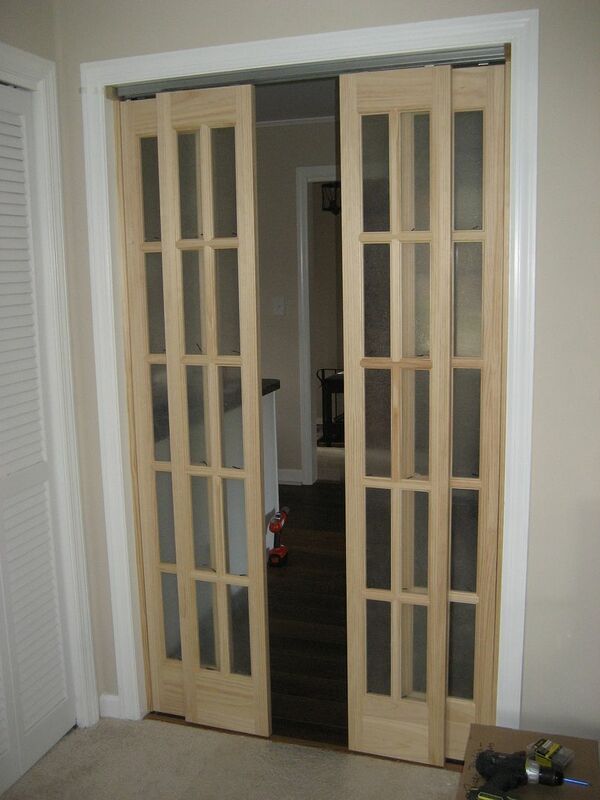 Total cost was $280 for the two sets of bifold doors (seen above) and about $35 for the hardware. Read more about the open floor plan (and why it’s so evil) here. Buy a Sears Homes Book Now!